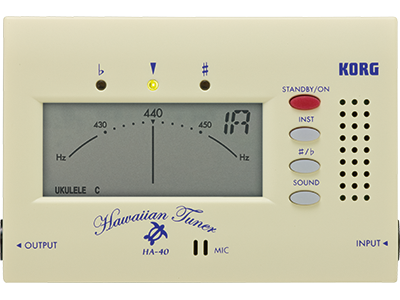 Announcing the HA-40, a compact and dedicated tuner for Hawaiian instruments. The HA-40 supports a variety of tunings for the ukulele and steel guitar. It features a highly visible display with easy to use functionality. 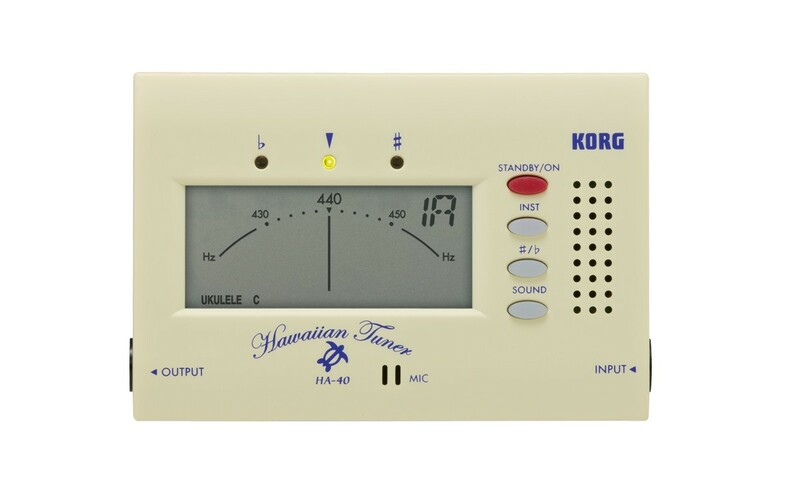 Korg, who has sold over twenty million tuners worldwide, has now created the HA-40, a dedicated tuner for the instruments of Hawaiian music; the ukulele, taken up by numerous people because of its beginner-friendly ease of playing, and the steel guitar, widely loved for its distinctive sound and performance technique. 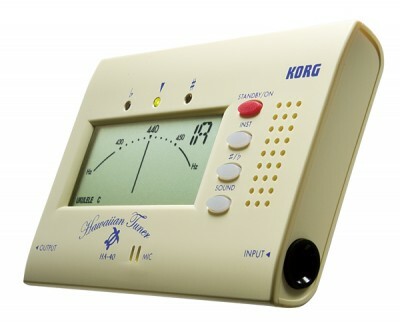 In spite of its compact size, the HA-40 is a high-precision LCD tuner with a detection accuracy of better than +/-1 cent, allowing you to tune accurately. It’s designed with the motif of a turtle, beloved in Hawaii as a guardian deity of the ocean. Sharp/flat tuning allows you to tune even with a capo attached to your instrument. The HA-40 gives you convenient ukulele tuning functionality in a pocket-sized package, making it easy to tune whether you’re on stage or in the studio. An output jack (bypass) has been added, making it easy to check the tuning even while you’re performing. In addition, by using the tuner together with the contact mic(CM-200), you can take advantage of quick and accurate tuning without any interference from outside sounds in the environment. The stand on the back lets you place the tuner on any surface. The HA-40 has a detection range of C1 @bbbbb (24.500 Hz) to C8 (4186 Hz), and also allows you to tune sharp or flat relative to standard pitch. You can also adjust the pitch up or down in semitone steps and tune your instrument with a capo still attached. The HA-40 supports a variety of tunings for Hawaiian instruments, two modes for ukulele and five for steel guitar. For the ukulele, the HA-40 provides LOW-G tuning suitable for solo performance as well as D tuning (American tuning) which raises the conventional C tuning by one step. A broad range of pitch detection is also supported allowing you to even tune steel guitars that have more than six strings. The HA-40’s Sound Out mode uses the internal speaker to play a reference tone for each string of the instrument you’re tuning. This allows you to tune more accurately by using both eye and ear as well as train your sense of pitch by listening to the reference tone. The Auto Power Off function conserves battery life by automatically turning the power off when the unit is not in use for ten minutes. The HA-40 is designed for long battery life, and allows approximately 85 hours of continuous use (continuous A4 input, Meter mode, zinc-carbon batteries).